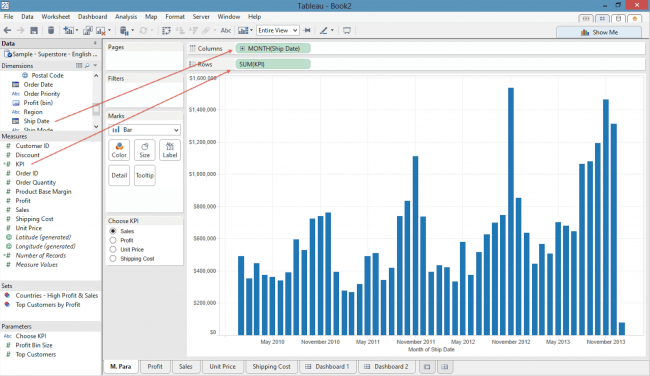 Let's take a look at parameters in Tableau! One reason why Tableaus parameters are fascinating, is the way they enables you to conserve vital dashboard space without giving up insights from your data. Let's say we are designing a dashboard displaying the development in a company's top 4 KPIs, and want them all displayed in only one dashboard. Combining 4 sheets into one dashboard is an option, but would most likely appear crowded. With parameters we're able to create one interchangeable graph allowing us to decide which KPI's displayed within the graph! Cool stuff. 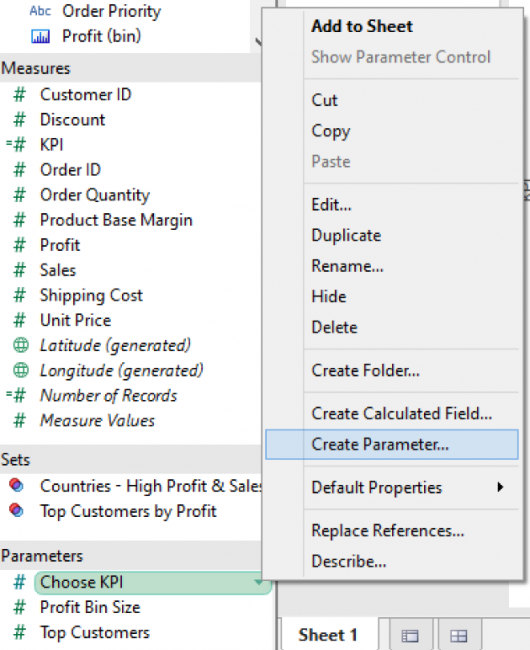 To create the parameter, simply right click in the dimension or measure pane and choose "Create Parameter"
Now we're able to define our parameter exactly as we wish. I have defined the following for our KPI example. A parameter in Tableau is basically just a list containing different values that we're able to choose between. It really becomes exciting once we realise that we're able to create calculated fields on the basis of these parameters. As before, right click in the dimension or measure pane, but this time choose "Create Calculated Field" instead of parameters. Notice how the parameter's displayed in purple in the calculation, while measures are displayed in orange. 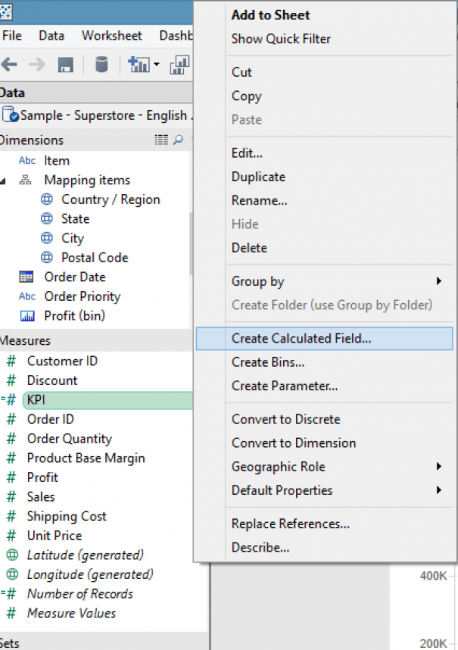 This feature makes it easier to obtain a quick overview of a given formula. Now that both our parameter and calculated fields are been created, we're ready to design our Tableau sheet. On the x-axis I want development in time, why I drag the "ship date" measure to the columns bar and set the view to months. Now I can drag our calculated field, named "KPI", to the rows bar and we have a sheet displaying a given KPI on the basis of our parameter. 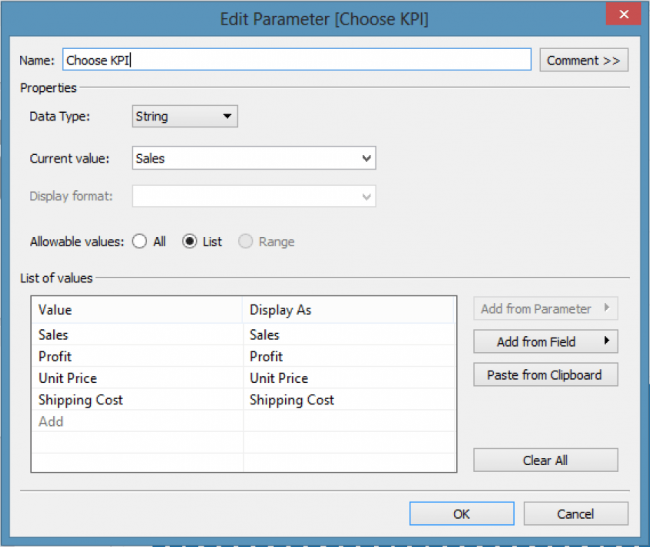 Drag our parameter to the rows bar, so that the axis label will be dependent on the Chosen KPI. Finally right click on the parameter and select "Show Parameter Control", this enables us of changing the graph depending on what we want shown. That's it! Now you know one of the many uses of parameters in Tableau. Below you can see the dashboard created with the use of parameters as well as a dashboard without.